"The plan includes constructing the road in phases, with the work zone completely closed to through traffic. 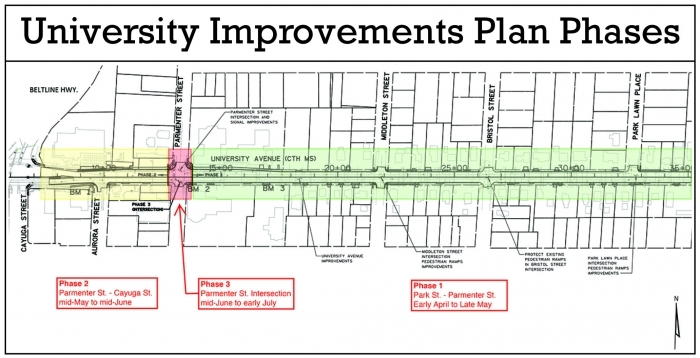 The first phase of construction, scheduled to begin April 22, will close University Ave. from approximately 450 ft. west of Park St. to the east side of Parmenter St. The second phase of construction will close Cayuga St. to Parmenter St., and the third phase will close just the Parmenter St. intersection. During construction, most businesses can be accessed from side streets outside of the work zone, though for the few businesses with driveways only on University Ave. customer access will be coordinated by the County. The preliminary schedule is for construction to be completed prior to the July 4 holiday,” explained Shawn Stauske, Middleton City Engineer and Director of Public Works. The city was finally able to purchase the former PDQ for $309,300 from owner John Lang. Lang, however, did not agree with the city’s appraisal after the purchase was made, and has filed a lawsuit against the city asking for additional money. The city took possession of the land on April 1 and is going ahead with environmental testing and demolition of the old gas station building this month. “In preparation for construction, the City acquired some additional right-of-way from both St. Bernard Church and the owner of the property that housed the former PDQ station. The city contracted the demolition of the former PDQ building to be done in the next couple of weeks, and the city will coordinate traffic signal upgrades and water & sewer utility improvements with the road work,” Stauske said. The street work is expected to cost $1.7 million dollars, $1 million of which will be paid by the city, not including the land purchase. The remainder of the cost will be absorbed by Dane County. “The design was done by Strand Associates through a City contract, and the construction work will be done by the County Highway Dept. with some of the work subcontracted by them,” Stauske added. Detours will reroute traffic around the construction site. The detour will followUSH 12, Century Ave. (CTH M) and Allen Blvd. (CTH Q). The Madison Metro bus route 71 will detour onto Franklin Ave. during construction. Motorists should expect delays.